Just outside of Washington, D.C. in Springfield, Virginia lies Super, Awesome & Amazing at The St. James, a 30,000-square foot active entertainment complex for kids. It includes an indoor waterpark, Ninja Warrior obstacle course, multiple climbing structures, trampolines, VR Games, Esports and more! Super, Awesome & Amazing is one of the coolest and most interactive indoor day-trip destinations for kids and families in the D.C. area. 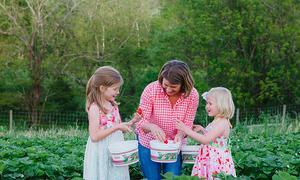 We sent two of our MOM Squad ambassadors and their families to Super, Awesome & Amazing. They received free admission in exchange for providing an honest review of their experience. Save up to 32% off admission to Super, Awesome & Amazing with this CertifiKID deal. Dayna: The St. James is a 450,000-square foot sport entertainment center where you can literally spend the entire day. We went for just the adventure zone, which includes a water park and climbing fun zone, but there is a spa, a celebrity chef restaurant, ice rink, batting cages, golf zone, indoor turf (where we watched a rugby match), and it looks like there will be retail stores added too. Jennifer: Super, Awesome & Amazing includes both an active entertainment center and an indoor water park that is loaded with fun activities for kids of all ages-- even for grown-ups! We began our visit at the active entertainment center and spent about two hours there. My 7-year-old twin boys made a beeline for the Nerf Battle Zone, which is a large climbing structure in which kids can have NERF gun battles. The Nerf guns and safety goggles are provided at the entrance to the battle zone, which includes slides, ropes, and other fun features. It's pretty easy to keep an eye on the kids from the outside. Even my 4-year-old daughter played in there, and I was struck by how nicely she was able to mix in with the bigger kids. Dayna: We spent almost 3 hours in the climbing zone part. This section featured three climbing structures, an American Ninja Warrior Course, a trampoline (they give you socks to wear), a climbing course that was in the air, and a battle ground with Nerf guns. Dayna: My kids and I don't love heights BUT we tried everything. The Ninja course was so much fun, we did that until we perfected it. The lines for each course moved quickly and the staff was helpful with putting on harnesses and helping the children with climbing. 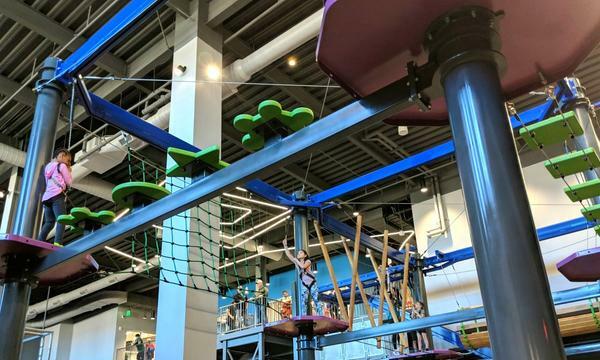 Jennifer: The active entertainment center also includes a ropes course, rock climbing walls and other climbing structures, a ninja warrior course, and an area for younger kids with soft building blocks and an interactive video game screen. Kids could throw small balls at the screen to hit various targets. Finally, there was a virtual reality area, but that comes with an extra charge, so we didn't partake in it. After two hours, we pretty much had to drag our kids out of the active entertainment center to head over to the water park, which is a short walk away inside the building. All three of our kids had a blast there! There's no pool, but there is a large climbing structure with plenty of interactive water features. 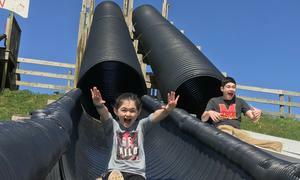 There are also five slides of various sizes — two large tube slides with twists, a medium-sized tube slide, and two smaller slides for younger kids. My more adventurous boy went down the large slides about 25 times, his brother went down the medium slide about 10 times, and my 4-year-old went down the smaller slides over and over again. They all had a blast! Dayna: The water park had great slides that were scary and fun to go on, over and over again! The only downside is that it is very loud inside because of all the water constantly pounding so it may not be suitable for all children. Jennifer: Toward the end of our water park visit, my daughter slipped on a step and scraped the side of her leg. One of the lifeguards rushed right over and was extremely attentive. She called for an outside lifeguard, who brought her into the office and tended to her wound as if she'd lost a limb! She was thrilled that he gave her a Disney princess bandage. My husband and I were happy to see how committed the employees were to the safety of guests. Dayna: We had lunch at the restaurant after leaving the waterpark. It has a full sit down side with a bar (for adult beverages for parents) and also a cafe side where you can order from the counter. The food was really good, not cheap, but worth the price for the quality. The customer service was excellent. We ordered gelato for dessert and it took so long to come out, that the restaurant comped us for the dessert plus gave both of my girls a gigantic chocolate chip cookie. Jennifer: The St. James was very easy to find, and it was a very easy and straightforward trip there. Once we entered the building, there was clear signage directing us to Super, Awesome & Amazing. There is a very large parking lot with plenty of free parking. We arrived around 10:30 a.m. on a Saturday and there were many spaces available. We did not have to wait at all! We walked right up to the front desk at both the active entertainment center and the water park. Jennifer: I would recommend spending two hours in the active entertainment center, as one hour would not be enough to experience everything it has to offer. One hour in the water park would be enough, though. Dayna: I would recommend 3-4 hours total at the waterpark and active entertainment center. Jennifer: Our children include 7-year-old twins and a 4-year-old, and they all had an equally great time! Dayna: My children are 7 and 10, I think the age range would be about 5-11. Jennifer: The water park provides towels in the locker room, so no need to pack your own! There are separate locker rooms for members of the St. James, but we used the public locker room. My only other small complaint would be the condition of the locker room. There are separate locker rooms for members of the St. James, but we used the public locker room. 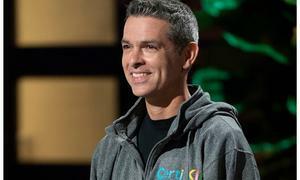 There were crushed Oreo cookies all over the floor near one bench, as well as used towels that people left on the floor rather than putting them in the receptacle. In hindsight, I wish I would have brought my swimsuit. The water park is in a small enclosed room, so it was hard for me to walk around the sides of it without getting sprayed. Luckily, because there were three lifeguards present (one in the climbing structure and two walking around the bottom), my husband and I felt safe sitting on a bench right outside the water park and watching the kids through the large glass windows. 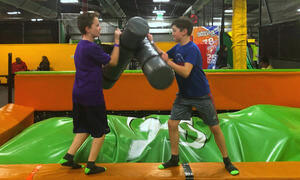 As for the active entertainment center, the trampolines and Nerf Battle Zone require special jump socks that cost nearly $4.00. However, you can bring other jump socks from home if you have them to trade in for free! One of our 7-year-old boys tried to attempt the ropes course, but got scared despite being harnessed in and came right down. I think both of our boys will really enjoy it once they are older, though. Dayna: Jump socks were included. Bring your own food to save money, there are plenty of places to sit and eat. We did not try the battleground because the kids were required to wear glasses and the staff was passing them from child to child without wiping them off with a sanitizing wipe. I mentioned this to the front desk when we were leaving and they said that should not be happening. Would Your Family Visit Again? Jennifer: All three of our kids had the most fun in the Nerf Battle Zone. I think they would have been happy spending all of their time there if there weren't so many other fun activities! They also had a great time in the water park. We will definitely be back for another visit! 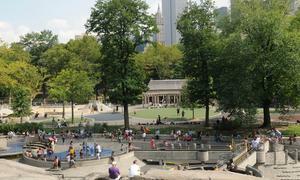 It's so convenient to get to, and there's something for kids of all ages! There are plenty of other activities within the St. James that you can pay to partake in if you're not a member, such as batting cages and sports fields. You can easily spend a whole day there! Dayna: It was a beautiful facility, we definitely loved the climbing/trampoline zone. It was nice to walk around and watch the other sporting events taking place. I would come back for the climbing zone and restaurant. If I lived closer I would definitely have a kids birthday party there.